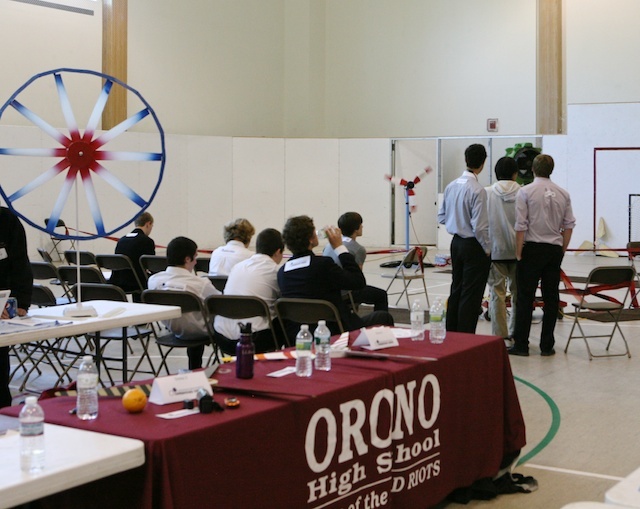 Orono- After 6 months of research, design and manufacturing hundreds of Maine students and teachers brought their wind blade creations to University of Maine to compete in Wind Blade Challenge May 3. Each team worked with teachers and a composite partner to design and manufacture their unique designs. Paul Williamson, Director of Maine Wind Industry Initiative, said "the goal of the event is to inspire students' exploration of alternative energy and composites materials through STEM education. Every year we are impressed with what the students come up with." 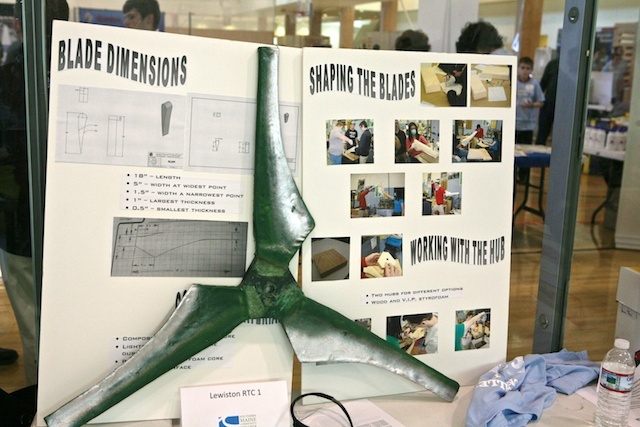 Each blade-design was placed on a turbine in a controlled wind as spectators watched to see how much electrical energy was generated in a circuit with variable load in two minutes; meanwhile teams of students gave presentations to panels of three judges representing industry, explaining their materials, their understanding of wind-power physics, and their process for designing their rotor or base. The combined scores determined the winners. The competition was tough with teams spinning fast enough to produce as much as 27 volts with their blades. In an glorious upset, first year participants Freeport High School had two teams in the top three. Jon Armory, Freeport teacher described the experience, "It is a wonderful event, and my students learned so much. One thing I really appreciated was letting students retry their blades after the trials, even though these did not count for points. 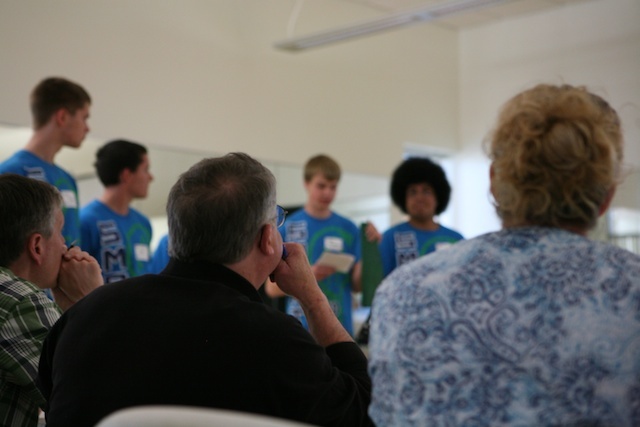 This made the whole event a learning experience where students could play and experiment." Different teams followed different paths to get here—One Brunswick teacher told us that their students met after school once a week, working for a total of about 20 hours on their designs and building. The Searsport District High School team worked in an engineering design course that met every other day, devoting about two months of the course to the process of building better and better rotors. The annual event, put on by the Maine Composites Alliance and Maine Wind Industry Initiative, is a collaborative effort connecting industry with high school students. Seventeen composites-companies including the Advanced Structures & Composites Center, Kenway, and Harbor Technologies worked with students to manufacture their blades in preparation for the challenge. Students used advanced manufacturing techniques and materials. 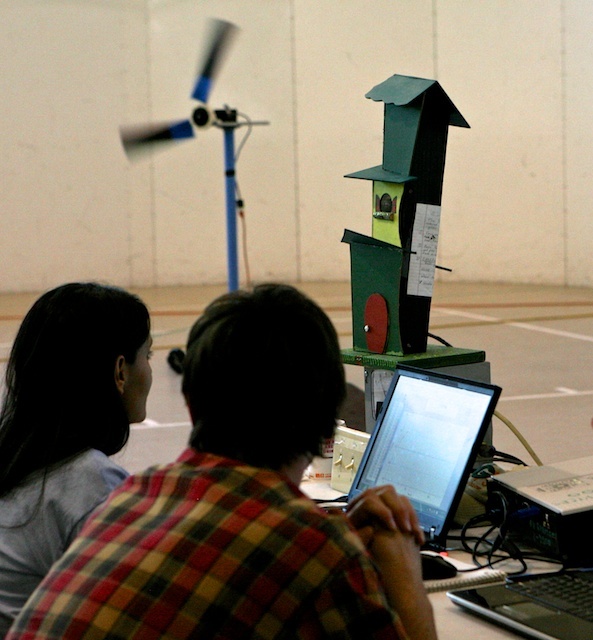 Concurrently the University held the Windstorm Challenge. 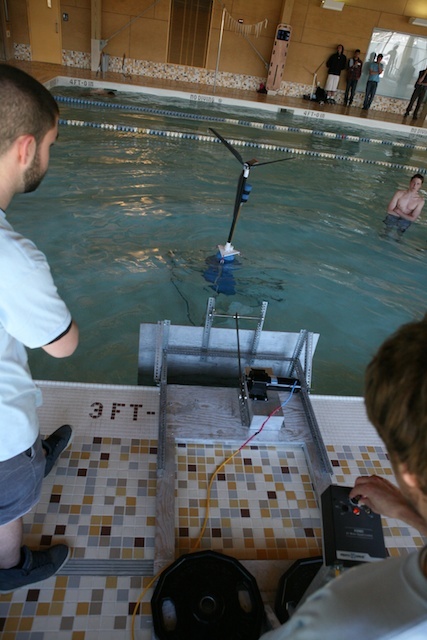 In that competition, 31 teams tested floating bases in a pool to see if they could withstand waves from a wave machine.